I’ve always dreamed of writing a soup cookbook. A book of recipes where there’s no need to carefully measure or weigh anything, variations are not only allowable, but encouraged, and cooking times are merely suggestions and not cast-in-stone instructions to be followed like the ten commandments. In addition, yes—most soup recipes can be successfully multiplied or divided, and yes—they can be made in advance and often frozen. And if someone adds an extra onion or potato to the pot, the world won’t open and swallow us all up, and life as we know it won’t end. Aside from clutching our hot water bottles, Parisians keep warm during the winter by eating lots and lots of hot soup. I make soup in the winter, since it’s easy, warming, and nice to have on hand. I rarely order soup in restaurants, since I can’t see paying ten bucks for a bowl of something that’s ridiculously easy to make at home. During the winter, just about every vendor at the markets here sells big wedges of potiron, or pumpkin, which I either oven-roast or peel and use to make soup out of. I actually just decided that the best way to cook virtually any vegetable not going into soup, especially root vegetables, is to oven-roast it. I’ll skip those fancy gratins or creamy purées in lieu of caramelized nuggets of pumpkin or celery root. But I recently decided to expand my culinary soup horizons when I saw this gnarly céleri-rave that was grown by one of the producteurs at my market. And into my basket it went. Along with that monster celery root, leeks are available in France very easily and used frequently, and I’m trying to get into the habit of using them, too. So a bunch went into my basket as well. Oddly, it can be hard to find certain root vegetables in Paris, like parsnips (j’adore…), horseradish (j’adore…), and rutabagas (j’adore aussi…), though. One vegetable vendor told me it was because of their association with the poverty of the war. But now the younger generation is discovering them and they’ve become branché or trendy, which is a movement I’m happy to promote. 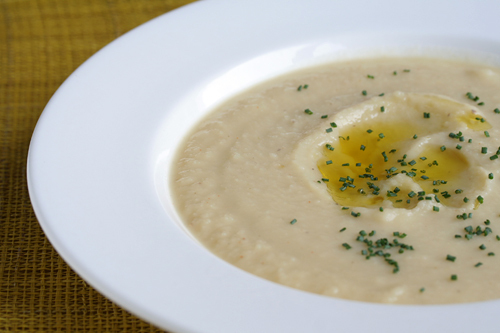 Celery Root Soup is very easy to prepare—and cheap. I think the entire pot of soup cost me about two euros and took me less than ten minutes to put together. You can use onions if you can’t find leeks. 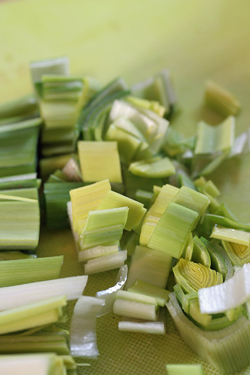 The best way to clean leeks is to cut off the green parts, which the sellers do for you here, making it easier to wend your way home. Then use a knife to make a long vertical slice, lengthwise, cutting the leek in half, but leaving the billy goat beard-like end intact. You then turn the leek a quarter turn, making another lengthwise cut. Then it’s easy to open up the layers and rinse out any grit. If they’re especially gritty, I swish them around in a bowl of cold water, changing the water until it’s clear. There’s nothing worse than eating gritty leeks, except maybe spinach. If that’s too complex (hmmm…maybe I’d better re-think this soup cookbook idea…), just cut the leek into pieces and rinse them thoroughly in cold water, letting them drain well before sautéing. This soup is also quite healthy and I don’t add cream or anything like that, but instead finish each bowl with a swirl of my freshly-pressed olive oil. I also just discovered white pepper, which I never understood. I mean, if you want pepper, black pepper always seemed like the right choice to me, not insipid white pepper. But then I remembered I had a small packet of white pepper from Penja, which has the spicy bite of black pepper but wouldn’t leave black speckles in the soup, if that’s a concern. My friend Judy, who teaches cooking in Tuscany, taught me to slice garlic very thinly, rather than mince it, which can cause it to burn. And I’ve been doing that even since. I like a mix of chicken stock and water, or you can use all water. Since moving to France, where canned chicken stock isn’t available (although “the cube” is), I’ve become a convert to homemade stock, which really makes a world of difference.As mentioned, soup is great because you can take it in so many different directions. Especially this one. I’ve mentioned a few garnishes that you might want to try at the end of the recipe, but I’ve been sprinkling my bowls of celery root soup with smoked salt, which can be found in well-stocked grocery stores and specialty shops. I love it. 1. In a large pot, melt the butter with the olive oil. 2. Add the leeks and cook for about five minutes, stirring frequently. Add the garlic cloves and season with salt, and continue to cook until the leeks and garlic are soft and translucent. If the pot begins to brown too much on the bottom as they cook, add another pat of butter or pour of olive oil. 3. Add the celery root and stock. (Or use all water.) Bring to a boil, then reduce to a strong simmer. Cook, with the lid to the pot ajar on top, until the celery root pieces are soft and easily pierced with a paring knife, about forty five minutes. 4. Add white pepper and chile powder, the purée using a hand mixer, or let the soup cool to room temperature and whiz in a blender until smooth. Taste, and season with additional salt and pepper if desired. 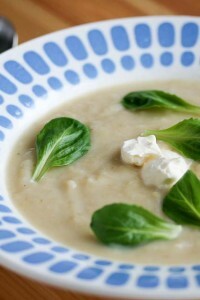 If the soup is too thick, it can be thinned with water or stock. To serve, rewarm the soup in a saucepan and ladle into bowls. Variations: Celery root has a distinctive flavor, but don’t hesitate to experiment with adding other ingredients. 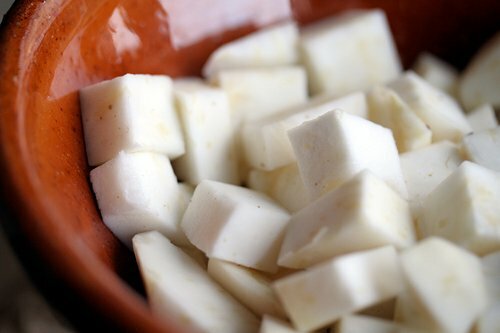 Cubes of pear or apple could be cooked with the cubes of celery root and puréed, a dusting of nutmeg, or some tangy crème fraîche instead of the olive oil are all worthy additions. I’m a big fan of chucks of crisp bacon floating around in there, or you can even add a swirl of another root vegetable soup, such as beet or carrot. And if you’re feeling opulent, this soup lends itself very well to shaved truffles scattered over the top. on a separate topic of things from home not being found in paris, I came across vanilla extract Sans sugar added! however the huge drawback was the price: it was 9.20€ for 30mls at le bon marche epicerie, of course. looks like it’s still worth it to bring it from home after all. I love soup and have to hold myself back from posting to many recipes for it on my site. It could easily be an all soup blog. I am loving your recipe, celery root is a passion of mine. I think it will be premiering in my kitchen soon. I love soups this time of year. How on earth do you peel that knarly (not in a surfer dude way of knarly) celery root? Do you just cut off and dispose of the exterior skin? I am going to say a big YES to David Lebovitz writing a soup cookbook! I’d buy it in a minute. Hot water bottle, followed by soup. Is there a theme here? Before you write a soup cookbook, check all the armoires in the antique shops first. Sometimes people leave great soup recipes in their drawers. We are having a kind of rainy, kind of windy, kind of sullen day here in Texas. I think it is the perfect time for some of this delicious looking celery soup. Thanks! Soup is also a good antidote to all of the rich foods and sweets I’ve been eating for the past week (ok, month). Strangely, it’s 65° in NYC today; not exactly a cold winter’s day! You’re not kidding about homemade stock — I’ve gotten into the habit of making it every time I roast a chicken. Hot water bottles and soup? You bet there’s a theme, and I’m seriously considering leek and potato soup for our supper (since I don’t have any celery root…). It’s friggin cold here in the Paris region. By 1pm, when I walked home from the market, the puddles were still frozen and there was still frost on the cars that hadn’t been driven yet today. 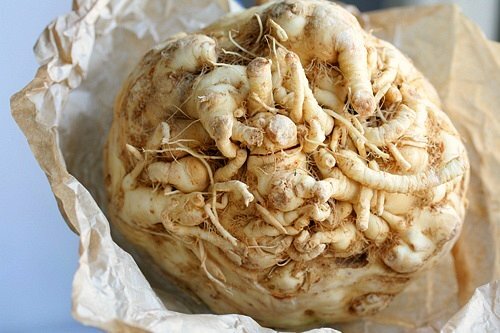 But celeriac looks so ugly don’t you think? Or is that just me? First off, great visit today!! Soup is one of the ultimate comfort foods–no matter what time of year. My maternal grandmother made an awesome chicken soup and I recall many years ago calling her to get her recipe. One of her key ingredients for flavor was parsnips–peeled and sliced down. She used carrots, bunch celery along with the tops and onions. In recent years I’ve added garlic and other interesting things, but I have always been a bit too shy on the salt and pepper. This past batch I was too heavy handed on the pepper, and even threw in some crushed red pepper. More water helped along with the cut peeled potato to absorb some. She also used cut-up chicken and left it in, until it was practically falling off the bones, which I still do today. Instead of stock, I might throw in a can of Manischewitz, to give it the extra something I probably missed somewhere. Also noodles of any kind help as well. But I printed this recipe to add to my binder filled to almost overflowing of your recipes ( and those from this blog). The celery root is a good idea. Speak to you soon. My love of soup, and making it – has grown wildly while living in Europe. Great soup! I’ve been buying only seasonal produce and cooking seasonal meals this winter and I am getting a bit tired of the squash. I will definitely try the celery root! It gets cold even in Arizona and a bowl of soup is very welcome this time of the year! The waiter I mentioned in the post did get his comeuppance when the head waiter, who also owned the restaurant, grabbed a few fingers worth of hair that was sticking out of his nose and gave it a good yank one night in the waiters station. Ouch! He was doubled over for a moment after that, although the rest of us thought it was pretty funny. elizabeth: I was a recent convert to white pepper after taking a sniff of a really good one. This is the Penja white pepper, which I bought at my local spice shop. I bought just a small amount, which wasn’t expensive, and has lasted me at least two years. Susan: Most of the celery root that one sees is pretty smoothed-out, and just needs a good shucking with a knife. Mine, as shown, was particularly goofy and I simply cut deeply into the area below those rooty-looking things until I got to the ‘meat’ below. C(h)ristine: Except most of my soup recipes are pretty basic and easy, so I don’t think there’s all that much demand out there for a book of my recipes. And besides, I need an excuse to keep all the chocolate around here that I do! Your soup seems also enjoyable, i’d love to try, especially because I like as much leeks as I like celery. The soup gets some grilled flavors and nice homogeneity with the cheese. 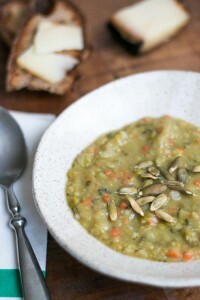 Judging from the very cold, very wintery December we’ve had in Chicago, I see months of homemade soups on the horizon. This looks lovely. This looks amazing – and so comforting – we’re having a lovely warm spell here in NYC, but I know before long we’ll be hit with the cold weather again – I’ll make it then – all I’ve got to do is find some celery root. If I don’t find smoked salt, what do you think of porcini flavored salt with flecks of little porcini mushrooms? And there’s me assuming you were a punk rocker chef comme moi? Ooh I love celeriac (as it is called in the UK). Our local greengrocers has a nice selection of posters from, I assume, the British celeriac promotion society or some such thing. They have grinning celeriacs with arms and legs and say ‘CELERIAC – THE UGLY VEGETABLE!’ and ‘CELERIAC! – FLAVOUR, NOT BEAUTY!’. I make soup two or three times a week, but have never made celery root soup. I don’t often see the roots in the market here, but I’ll keep an eye out now and give this recipe a try. For me, the freewheeling nature of soupmaking really appeals; I’m a good improviser, and I love to recycle leftovers into one-of-a-kind soups. I have veered far away from this strange looking vegetable fearing that it might attack me or, worse yet, mutate into a further ‘unknown’ as it sits awaiting rescue in the vegetable bin of the fridge. Perhaps I now have the courage to commit to it, well, at least I can peruse the produce aisle and ‘act’ like I ‘know’ what to do with it. Not ordering soup in a restaurant? What about a Bouyabez with real Aioli and toasts? What about a fab. Tomato soup with basil and orange juice I have stamblled upon in Italian chain restaurants in Oxford and Chester? (By the way do you happen to have a good recipe of this soup?). What about when it’s freezing outside and you are hungry and the first thing you think about is soup (ah and you are a tourist)? Well I think I made my point. i think that’s a very handsome celeriac you’ve got there. this recipe sounds great. and luckily we have a celeriac and some leeks sitting in the fridge. unfortunately, my boyfriend is very odd about soup – he only likes clear soups for some reason. perhaps this will convert him? maybe so, especially if i followed your bacon-scattering advice! Tut Tut: wonderfully bitchy! I like you. David, it’s your attitude towards cooking and eating food that deserves to be presented in as many cookbooks as possible–the recipes are just filler! For our main meal, on alternating days there is always a meal in a soup bowl for us. Though I have always love soups from earliest memories, canned, homemade, restaurant, during the ten years of living in France, my soup-making has become a much bigger part of our menus. Here, it does not seem odd if I go the extra mile and bake the pain de campagne whose thick slices are then grilled in their garlicky olive oil state landing up eventually (among other things) in soupe a l’onion gratinee a la parisienne. Btw, if your blender container has a snap lock lid, then it can be safely filled with hot liquid just below the top measure point with no danger of being scalded via exploding fluid bombs. Michelle B: I’ve recently become a full-on convert to the handheld electric mixer. Not only does it do a great job, it’s much easier to clean than the four parts of my blender. I haven’t seen a home blender with a snap-on lid, but we had a giant one in the restaurant and stuff would still fly out the steam hole. So I always want folks to be careful. And your bread & garlic pain de campagne is a terrific idea. Smeared with tapenade, that was another addition I would add to this, too. marmitelover: I avoid censoring or deleting things on the blog, but on some occasions will edit a comment if I feel it touchs on a subject that readers might be particularly sensitive to. Since there’s an international readership, I try to be respectful as I can of others: what someone in America or Iceland, for example, might think is funny, another person living elsewhere might not find it so. Thankfully, a majority of the time, the comments are funny or insightful, and I’ve learned a lot from my readers. Contrasting opinions are welcome, and encouraged, but there’s enough hollering at each other in the world, and in the rest of the media, that I like to keep the banter friendly around here. I agree with the comment policy at Simply Recipes, and more info can be found in my FAQs. sam: There’s also a new soup cookbook by your local-boy George Morrone, Simply Elegant Soup, but I haven’t seen it so can’t comment. But should I ever do a soup cookbook, I know exactly who I’ll dedicate it to. radish: Yes! That mushroom salt would be great. Although living in NYC, you should someday pick up a bit of smoked salt. It’s really great, and I brought back about five different kinds from my last trip to Texas, including the one shown here. Just wanted to thank you for the great blog. It is the only food blog I visit regulary, bordering on religiously! Happy New Year and I’ll be looking forward to the next 12 months of your entries. I crave soup every single day the temperature dips below freezing, but the creamy veloute soups in Paris are just so heavy and I end up making soup several times a week. Please write a soup cookbook! I need more ideas….who knew celery root could make a tasty soup? I will try it this weekend for sure. In your cookbook, you can include a chocolate dessert soup and that will allow you to hoard chocolate in the name of research. I too am a stock convert and cannot believe I ever used the stuff in a can….and as for the cube…it should be outlawed! Every weekend I buy a rotisserie chicken at the marche and use the bones and a week of veggie scraps (onion skins, carrot peels, tomatoes, parsley stems, etc) to make a rich stock. So in my kitchen there is no waste at all and the result is liquid gold perfect for soups, sauces and my favorite….risotto! There is absolutely no substitution for real stock. David, thanks for giving me the motivation to give celeriac a chance, what with its daunting exterior and sublime interior (hmmm, that sounds a lot like some people I know). For anyone who can find panais (parsnips), here is the soup I made last night: peel parsnips, boil/simmer until very soft in homemade chicken stock, puree until perfectly smooth, and adjust seasoning (if needed) with salt and pepper. That’s it, except for optional garnishes of heavy cream and freshly-grated nutmeg. Soooo simple yet soooo good. For one carcass…use the equivalent of 2 onions, 2 carrots, 2 celery stalks. You will be surprised how fast these little pieces add up to in a week. Tomato, garlic, shallots, leeks, herbs are all a bonus. Just use what you have. I keep all my scraps in a bag in my fridge as the week goes by. If you don’t have time one week, toss in the freezer for the following week. Chop up the carcass a bit and break the bones (bc the marrow gives so much flavor) put everything in a stockpot and cover with cold water. Keep just under a simmer for 2 1/2 hours. Strain, cool and remove fat. Voila. Perfect rich stock without buying a single ingredient. You will have 6-8 cups depending on how much water you used in the beginning. I use it up faster than I can make it, but it freezes for months. 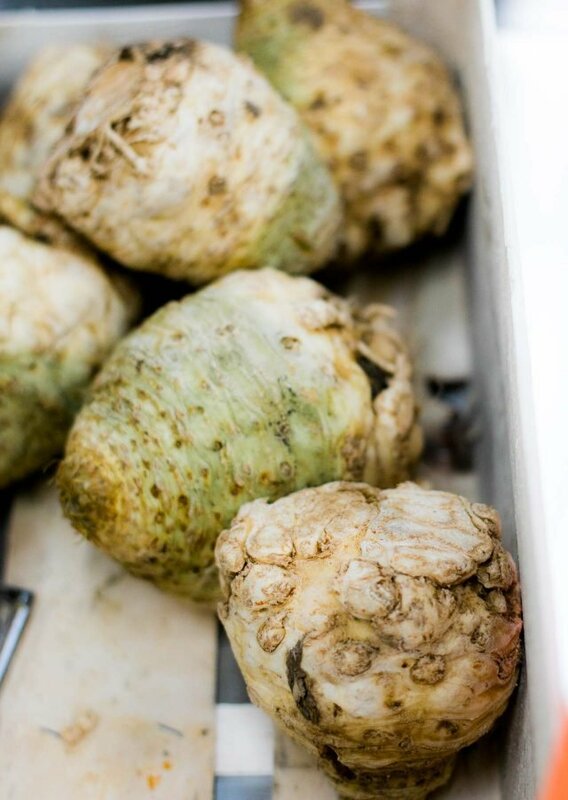 Does celery root lend itself to roasting at all? For example… what about tossing the cubes in oil and roasting in the oven, or even just in the soup pan to get some caramelization going before proceeding with the soup? Erik: you can most certainly roast celeriac. I treat it pretty much exactly like a potato, in fact, and it works brilliantly. Roast celeriac, celeriac dauphinoise, celeriac mash… and it’s brilliant with a touch of mustard (of all varieties), added wherever and however you see fit. What is the distance from a bowl of soup to a slice of cake? And in what manner this distance brings together extremes of ourselves into the utterly divine -yet humane- feeling of comfort, intrinsecal of a good and simple meal prepared from scratch and with care…? I enjoy a lot reading you, Mr Lebovitz, you do not only concoct wonderful recipes but also smiles in my exhausted maternal face. I wonder how do they taste! To me, they are sweet treats in my ever-tiring days. Ultimately, is the gossamer of the Beauty in Art, be it cooking or poetry, which, at the end, are just the same. Great site and belated happy birthday David. makes me feel at home sitting reading your blog as I have also just turned 50 aaargh! and after spending 30 something years in the kitchen I know how you feel . amazing eh! how time flies . I stumbled upon your site looking for a chocolate recipe and and still haven’t followed it up as I’m always sidetracked with the comments and amusing blog .I totally agree with a vague recipe book where quantities are left to the reader . tastes vary and so does availability of produce .leave a little guess work and you get a creative cook . regarding soup, I make and freeze veg and chicken stocks . then use them as a base for whatever takes my fancy at the market . At the moment we have great artichoke (the root variety ). a bit fiddly to clean but make a great soup. pop in some new potatoes, a touch of garlic ,a quick whizz with the hand blender and hey presto , heaven ! Now where’s that chocolate recipe he’s on about … . 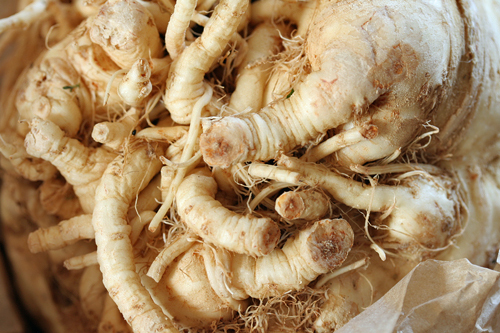 What a beautiful celery root…I love your pictures of it. Sort of the root vegetable version of an ugly-beautiful woman. I have had a rutabega knocking around in my fridge for the last week and a half…any delicious soup recipes you know of that I could use it in? Soup is like the savory partner to ice cream, something you can just stick in a bowl and feel satisfied. I named my blog Three Bowls for a bunch of reasons, but one was I realized most of my meals are in bowls rather than some plated tidiness. I think soup and ice cream make up the base of my own personal food pyramid. For the vegetarians out there, if you want to make this soup with a very flavorful vegetable stock, I cannot stop running around shouting about how great Mark Bittman’s roasted vegetable stock is (it’s somewhere on the NYT site if you search for it). If you are not eating meat or poultry, it is a good way to add that deep base flavor that is hard to otherwise achieve with vegetarian cooking. It’s a bit of extra effort but so very worth it. Au contraire, David! Do do do write a soup cookbook! I practically live off homemade soups. I would love to read your recipes and variations, like this one. We (Americans, at least) need to go back to simplicity with our food. I think most of us don’t have much of a clue how simple things like soup can be to make. I think you’d have fun with it. And think of the humble root vegetables that need your support! Thank you for this delicious soup. It was the perfect foil for our damp and chilly Bay Area weather. I added some sauteed sausage and followed your suggestion of crispy bacon, finished with a sprinkling of smoked salt. The last two additions elevated the soup to divine! I’m so glad I found your site. Beverly: Isn’t smoked salt great? It’s such a wonderful condiment and really does make a difference, even if you just add a gentle sprinkle. People think I’m a little nuts for having 9 or 10 salts in my kitchen, but I enjoy them all and use them for various purposes. Glad you liked the recipe! 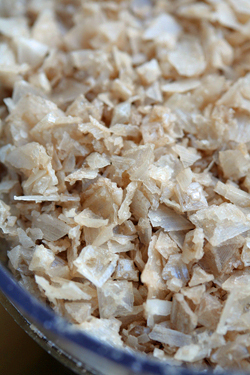 Incidentially here’s a smoked salt recipe for those of you with stove-top smokers. You could likely rig one up yourself, too. Now I know what I’m going to do with the celeriac sitting in my frig! David, thanks for the prod on soups. The celeri rave is definitely in season here, so I’ll give that one a go next time I’m at the marche. The chicken, potato, and leek soup was a real hit — my 9-year-old ate two bowls (go figure!). I just tried the soup without chile powder( because I did not have) and it came out wonderful.. Thanks for the great recipe. YUM! I discovered this gnarly root in my CSA veggie box a few months ago. I also had some leeks in the box. I googled leek and celery root and found this recipe. It is amazing and I have made it many times since. I also included some cauliflower puree one time when I had some that was on it’s last leg and needed to be used. I’ve also tried crisping up some turkey bacon which was wonderful with the soup. 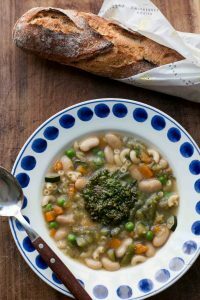 A bowl of this soup and a chuck of fresh crusty bread is heaven. I make extra to freeze for busy week nights. When I was making this tonight, some bourbon happened to find its way into the pot. It worked quite well, I think!